A new range of Mec-Flex safety gloves aimed at cutting down the level of hand injuries sustained in activities from simple handyman tasks right through to high-impact mining, oil and gas duties has been introduced by Elliotts. 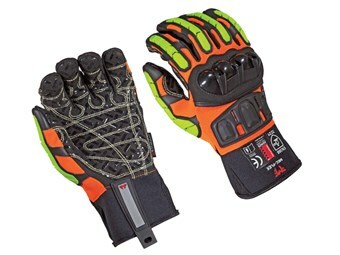 Elliotts' Mec-Flex Oiler XTR safety gloves. The gloves are both impact and cut resistance, and are the first to be certified to the AS/NZS2161.3:2005 Occupational protective gloves and European CE standards, which provide protection against mechanical risk. Oiler Series: Heavy-duty industrial gloves designed specifically to protect the wearer against impact injuries, bruises and pinched fingers in the Oil & Gas and Mining Industries. Elliotts says these gloves offer "exceptional top of hand and finger protection with a palm design offering grip, high tear and excellent abrasion resistance". Utility Series. Made for day-to-day handling and utility tasks where high visibility and form fit are required. ImpactX3: A form-fitting design which provides back of hand and finger protection with an impact and vibration absorption in the palm. They are available in both full-finger and fingerless versions. Rigger GT: A comfortable goat-skin-leather rigger-style mechanic’s glove. It features a cool Spandex back with top-of-hand and finger protection and a reinforced palm. Quick Fit: A versatile, economical glove designed for professional and handyman tasks. Click here to find safety equipment for sale.